An outreach programme run by Helsingborgs IF football club and co-funded by Lindéngruppen is encouraging young people to make active choices to avoid being caught up in violence and anti-social behaviour. The Ung Aktiv 9 programme is aimed at 15- and 16-year-olds in their final year of secondary school and helps to make them aware of the importance of making positive choices and the consequences that keeping bad company and making passive choices can have on their lives. Launched in 2014, Ung Aktiv 9 reached 400 students – around half of all those in their age group in the city – in its first year. The aim is to double this number in 2015 and ultimately reach 80 percent of secondary school leavers in Helsingborg. 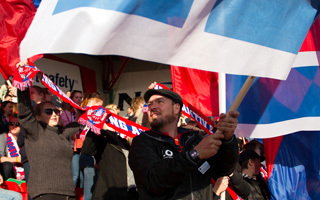 The three-year project, run by the Helsingborgs IF football club, seeks to show young people that it is never too late to change, and that if they make a mistake they can choose to behave differently next time. The programme is in three steps. After listening to in-class presentations, students stage a theatre performance in collaboration with Helsingborg City Theatre and professional local actors. The project concludes with free attendance for all participants at a Helsingborgs IF match against a side from Sweden's top Allsvenskan league. Project coordinator Alexander Ström says: "We educate youngsters to think correctly and to reflect on what they're doing. And we concentrate on showing them not to think wrong, but to think right." He says the focus is on helping young people to make informed, active choices rather than bystanding or acquiescing to bad behaviour by friends or others in their social circle. "We show that it's all about making good choices. You always have a choice. You can leave a place and choose not to participate in bullying, violence or whatever's going on. You can make yourself see the consequence before taking the action." Ström, a former Swedish swimming champion and supporter liaison officer for Helsingborgs IF football club, knows his subject. He is a reformed hooligan, having fallen into bad company when his swimming career ended. "I found excitement in fighting and disruptive behaviour at ice hockey matches. I used to travel to matches with a gum shield in my back pocket, ready for when the fighting started," he recalls. "I was missing the adrenalin kick from swimming and started to get a similar boost from violence in and around the ice hockey arenas." But when a group of visiting supporters from a rival team smashed up a pub in his home town, traumatising families and elderly guests, he realised his life was out of control. "I understood I was part of the problem and knew I couldn't be part of it anymore. I learnt that there are better ways to use your adrenalin. Just being in the stands and supporting your team. Doing sport and fitness. Having hobbies," he says. Daniel Kapinkovski, 15, of Wieselgrensskolan in Helsingborg, says Ung Aktiv 9 has made him think twice about the company he keeps and opened his eyes to the potential consequences. "If you get involved in violence you can get injured and if things really go wrong people can die. I've been tempted at times to get involved in these things myself – in fact I've come really close – but this has made me stop and think about the consequences." Student Anita Lajqi, also of Wieselgrensskolan, says Ström's story made a strong impact on her and her classmates. "Having been in that situation himself, he understands what it's like to be caught up in that sort of thing. Young people can relate to that, "she says. The theatre event, put on by 400 students, was an interactive play – "A Gang on Stage" – in which the actors invited audience input. The play was performed five times for students and guests in Helsingborg. Play director Karin Forsslund says it is important that young people realise that active decisions are a matter of personal choice. "Not everyone has the same prerequisites in life. Some of us have greater scope to act in certain ways due to specific factors in our lives. But everyone can make choices that we decide over ourselves." 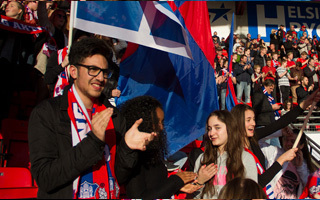 In April 2015, all participating students were invited to attend a game against Norrköpings IF. Before the match, they gathered for activities connected to personal values, friendship and non-violence. At the event they had a chance to listen to a brief talk by Helsingborgs IF coach and former Swedish international star Henrik Larsson and to ask questions.